structure require attention to situation-specific factors, and situation-specific theories? The beginning of this thread of scholarship was the question, is there anything marginalized groups, or people in marginalizing situations have “in common?” This not only included marginalization based on identity or group status, but on social processes, cultural expectations, environmental and socio-political factors. We agree with Chinn and Kramer that emancipatory knowledge is foundational to nursing science and practice. There is an aspect of person that is potentially universal, a striving toward survival, thriving, and belongingness in such a way that supports diversity, equality, equity and justice. But this is not feasible for so many in the world at this time in history. As a newly practicing RN, I was also, (in my spare time), an activist in the Catholic Worker Movement, and part of a group who opened a house of hospitality for women and children in Dubuque Iowa, my home town. Eventually, we became a “discharge plan” and patients were sent from the local hospitals to “Catholic Worker House.” The patients I cared for from noon to midnight in the psychic unit the night before might arrive in time for dinner the next evening and stay for two weeks. This 6 years of my life was a great education about the highest-risk people in our communities. We as a community combined providing food, clothing and shelter for those in immediate need with political action on larger justice issues. At that time, liberation movements were growing in Latin America, and I became involved in discussions with various liberation and feminist theologians. In particular, I formed a partnership with my friend and mentor, now deceased, Manolo Barreno. Mano was a liberation theologian from Ecuador who had been thrown out by the Jesuits from a seminary in Rome for “associating with communists,” poor folks, who then not only took him in but supported his journey to the US, to Iowa to finish his PhD at Aquinas Institute of Theology, which happened to be in Dubuque. Mano and I were fast friends, and became agitators in the group, pressing for justice not only in Latin America, and locally, but for structural changes in the Catholic Church itself. The movement by survivors of sexual abuse by ministers and priests (SNAP), was emergent. Those who joined Mano and me pressed for women in the Catholic priesthood, and support for a local woman who taught at a Catholic school, and was fired specifically because she had a baby and was not married. We pressed for LGBT full recognition by the church. I took a graduate course at Aquinas Institute in christology, the search for the historical Jesus. I realized the complex level of scholarship that had been done to determine hermeneutically, anthropologically, and historically who Jesus of Nazareth was. I knew the power of writing that could influence sociopolitical and health outcomes. I realized I was capable of taking a graduate class. Fast forward, I decided that I might have more influence in solving the problems I became so familiar with as an activist, by contributing scholarship as a nurse leader as a nurse scientist. Working with Afaf Meleis and Patricia Stevens, we began in 1994 to answer that initial question, “Is there any thing, process, or set of elements, that is common in the experience of being marginalized? Rather than an “identity categories” approach, the scholarship on marginalization focuses on the fact that anyone can be targeted, or suddenly find themselves in the high-risk situation of being marginalized. This more contextual approach is consistent with an intersectionality framework, in which we realize that a person is potentially subject to marginalization based on a number of factors, and that, for a Black lesbian woman, for example, interpersonal slights may set off a whole energy-consuming and stressful problem-solving process for the woman, who is in a quandary about what the basis for the insult is. “Is this based on race? Is this because I am a woman and he is a man? Do they know I am gay? Is he just pissed off about something else? etc…. This is far less often a subjective experience of White, privileged males. In fact research shows that those who are privileged, including White health care providers, have implicit biases, prejudices leading to racial microaggressions that White people are usually not aware they are perpetrating, and that has harmful effects on the target person. We discuss much of this in this article, which is an update on recent scholarship relevant to marginalization. Why should we as nurses be concerned with understanding political dynamics of the world we live in? 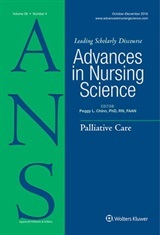 We hope this perspective helps nurses to be able to see the striving of human beings toward fullness of their lives, without amputating their culture, their understanding of their gender identity, their sexual orientation, their partner, their color, their religion, their abilities, and /or their substance use/abuse status. The emancipatory nature of human beings is as real as is their psychological, social, and physiological developmental processes. It is striving toward autonomy, self-determination, group-self-determination and respect as equals among other groups. Therefore as nurses, we should assess where people are in terms of their own liberation. This starts with safety, but goes far beyond, to wisdom, transcendence and action for those defined as “other.” Or “them.” This is advocacy. I asked Dr. Kelly Carlson, coauthor what she might feel is relevant for this blog, and she replied that if we apply analysis to what is being said in the Trump presidential campaign about the Muslim parents who have spoken out in opposition we will see the discourses underlying such comments, and their implications. We are in an era in which, for instance, crowds, or mobs yelling “lock her up” about Hillary Clinton is reaching a level of social “acceptability.” Instability and globalization have now led to xenophobia and the migrations of millions brown people from diverse regions affected by extreme poverty, political persecution and terrorist attacks. In the US, White privilege is systemic, and we have seen biased decisions by police resulting in statistics that look like systematic execution of people of color. The War on Drugs resulted in mass incarceration of African Americans and Latino/as. The privatization of many of our prison facilities means that services, and even administration is “outsourced” to corporations, for profit, and the labor of prisoners becomes part of an enterprise reminiscent of slavery. As psychiatric nurses, Kelly and I are particularly concerned with the “non-state” of mental health care following closure of state hospitals. The private corporations who stepped into that gap have been found to be far less concerned with quality of care, and are inadequate to meet the needs. Thus many enter the health system in costly ways, such as through the ED. They fall through the cracks, at taxpayer expense. Kelly pointed to another example of the return of a “slavery” system in the network of human trafficking, now pervasive in the US. We need to see the many ways people are marginalized, and how that affects health. We need to end health disparities. Nurses can develop knowledge through the lens of marginalization, viewing the person in part as an emancipatory being, striving toward impacting their sociopolitical environment. It is about exerting self-will, and group self will. We challenge nurse scientists, and health related scholars to include marginalization, and the real-life contexts of our patients, whether we are providing hands-on care, or making policy decisions at the population level. We can use social media, and mainstream media more effectively to shape the public discourse about health, and to define it broadly to include issues of discrimination, stigmatization, violence and symbolic violence. Emancipatory knowledge will always need updating, as it is so closely tied to structures and processes of the larger social, cultural and political environment. It requires a historicist perspective. We invite dialogue on this article, and the issues and questions it raises for nursing. I apologize for the grammatical and typographic errors in the post. Events in Milwaukee over the weekend exposing decades of segregation and poverty in the Black community are painful to watch, but unsurprising to me; I was on the UW Milwaukee faculty from 1994-1998. As nurses we have the conceptual lens and skill to lead in the struggle for justice. We see the whole picture. If we look. The presidential election is now the most polarized in history. We need to come together for an agenda that values the health of all. And vote!